AWS CloudFormation is an amazing tool for infrastructure as code. What used to take weeks to do on-premises, is now possible in a few minutes with some JSON, or better yet, YAML. This doesn’t mean we can’t do better and improve our efficiency even more. You won’t notice any problems working with a few CloudFormation stacks. A few dozen stacks later, or complicated stacks with many resources though, and we need to start optimizing. Let’s take a look at how we can up our CloudFormation game with Microsoft’s Visual Studio Code. This article assumes you are familiar with Visual Studio Code and are using YAML based CloudFormation. One thing that always catches out people with editing YAML, is indentation. This is especially true for large CloudFormation files. Take a look at this snippet. Can you see the error at a quick glance 👀 ? Thanks to the colorization and highlighting of the indent column, it is much easier to see that the Resource property is incorrectly indented at a quick glance. Add the following user setting to enable the extra highlighting of the block located at the current cursor position. 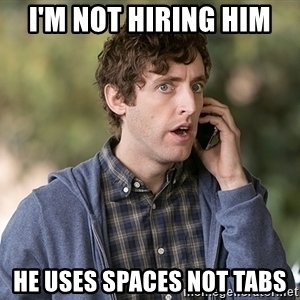 Tabs? Spaces? What style of line endings? Use EditorConfig and end all the discussions. 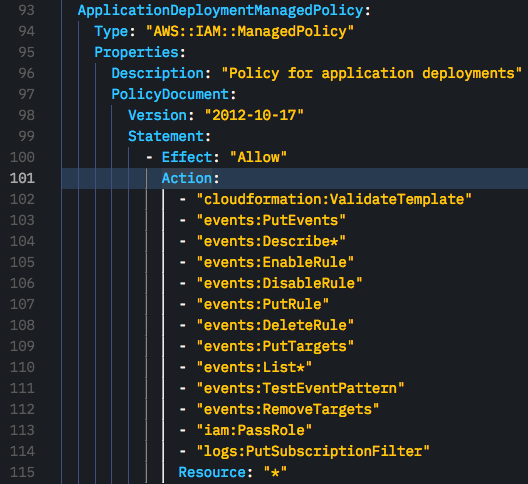 EditorConfig helps maintain consistency across your CloudFormation files by defining rules which the editor will apply on save. Install the EditorConfig for VSCode extension. Don’t worry, there are plugins for many text editors if the people you work with don’t use VSCode. Every time someone with EditorConfig saves a file, it will update the YAML file according to your rules 💪 . Do you like to keep things sorted alphabetically? 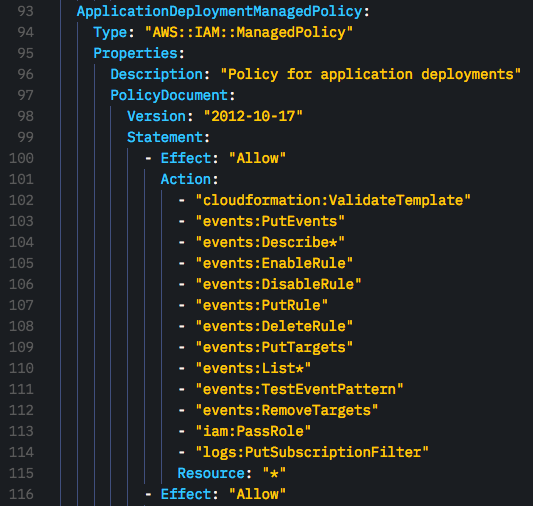 It makes it easier when you are looking over massive files or IAM policy statements. You shouldn’t have to say “A, B, C, D…” in your head every time we want to sort something, though. Install Sort lines and enjoy the alphabetical awesomeness. Highlight a block of the CloudFormation template, open the command palette and type > Sort lines. If you are like me, you can’t remember the few hundred CloudFormation resource types and properties. We can use VSCode Tasks to make our lives easier. A task is a simple block of JSON which can execute commands on our machine. ⚠️ The above will only work on Mac, you will probably need to call Start-Process as a PowerShell Task on Windows. From the Command Palette, choose > Tasks: Run Task, and select CF Resource List. This quick launches the AWS Resource Types Reference page. For the CF Type Search command to work, first highlight a CloudFormation resource type and then from the Command Palette, choose > Tasks: Run Task, and select CF Type Search. Recently, AWS created a tool called cfn-python-lint, which checks your CloudFormation templates for errors. This gives early feedback and reduces cycle time when creating or updating CloudFormation templates. Instead of submitting a bad template and waiting for the CloudFormation service tell you its bad, let VS Code tell you as you type! To install the linter, you will need Python installed. If you are on Windows, I would recommend installing Python from Chocolatey. Verify the install worked by running cfn-lint --version. Next, install the vscode-cfn-lint plugin. Now when you are editing a CloudFormation template, you will get issues underlined and Problems listed when you make a mistake. ✅ You should also use cfn-lint as part of your validation of pull requests on your CloudFormation repositories. Got a template with a few thousand lines? Navigating it, and finding the block you are looking for, soon becomes a scroll or search-fest. First, install the YAML Support by Red Hat extension. Unfortunately, due to a bug 🐛 we are going to need to disable the YAML validation this extension provides. It currently has issues supporting CloudFormation intrinsic functions. I will update this post when this issue is fixed. Add the following user setting to disable validation. Inside your YAML file you will be able to see the logical names of all your resources, search through them and quickly jump to the right section of your CloudFormation template. Even though CloudFormation frees up a HUGE amount of time for you as an Operations engineer, it doesn’t mean you shouldn’t keep optimizing your processes to be as efficient as possible. Hopefully with these tips, you can go from a CloudFormation user to a CloudFormation rock star ⭐!